Yikes, it's that time of year already. No wonder Richard has been holed up in his shop for hours on end; he's been churning out knives for the show. If you're in Atlanta on June 5-7 please come visit us. We will be at a new table yet again -- look for us at Table 2-D - almost back to our original place. 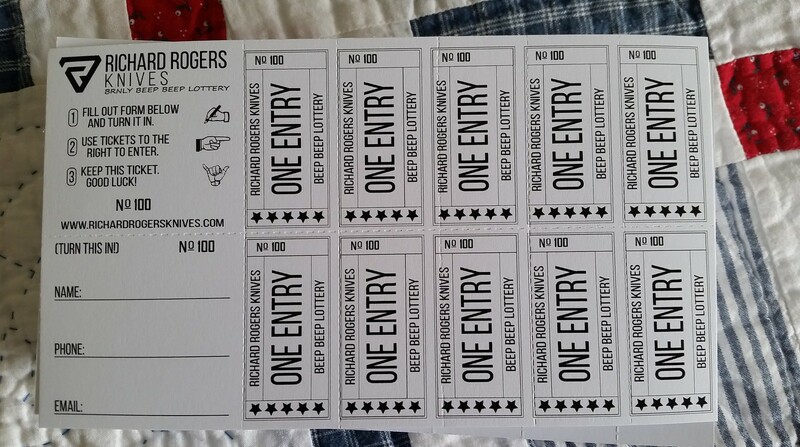 We will have 8 knives for sale under a lottery, 1 lotto knife open only to Rogers Rangers, one Open Bid knife open to all, and a few knives and swag available as first come, first served. Oh, we will also have a couple of prototypes to fondle. We will start selling at noon on Friday, lottery drawings will be at 2:30 on Saturday, and Open Bid will end at 4:00 on Saturday. We will be using the handy-dandy cool tickets modeled from the Burnley Beep Beep lotteries. Aren't they clever and fun! [caption id="attachment_711" align="aligncenter" width="300"] Only gotta write your name once! [/caption] After a lot of thought we have decided that attendance is necessary in order to participate in the lotteries. We would like to be able to allow all interested parties but it would just cause too much work and problems on our end; sorry. The lottery tickets are limited so one ticket per person. There will be 50 tickets available Friday and 50 on Saturday - if you'd like a chance at a knife please don't wait too late in the day to visit our table. Open Bid will be available to everyone interested, however. 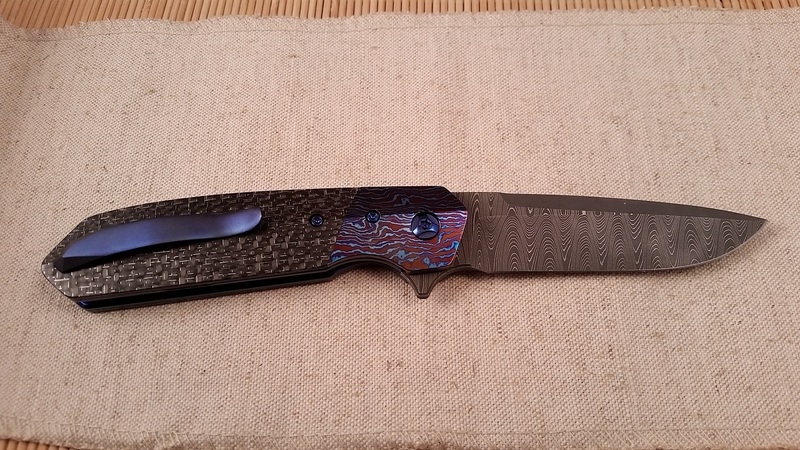 Anyone, whether in attendance or not, will have a chance to bid on the knife. You can make contact with me either by email, text, or pm on FB. Email to the address posted on the sidebar above, or if you prefer text email me and I will give you my number. We are assuming we can get wi-fi in the building but sometimes it is very spotty. Let me know your highest bid & I will proxy bid by $50 increments. I will also try to update the FB page and the website. I can let you know by pm when it gets to certain numbers. Opening bid is $1000. 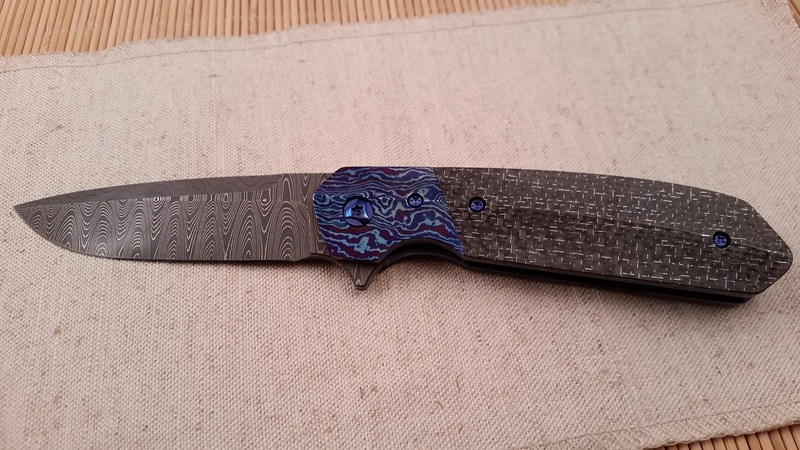 Bet you'd like to know what the Open Bid knife is, huh?! 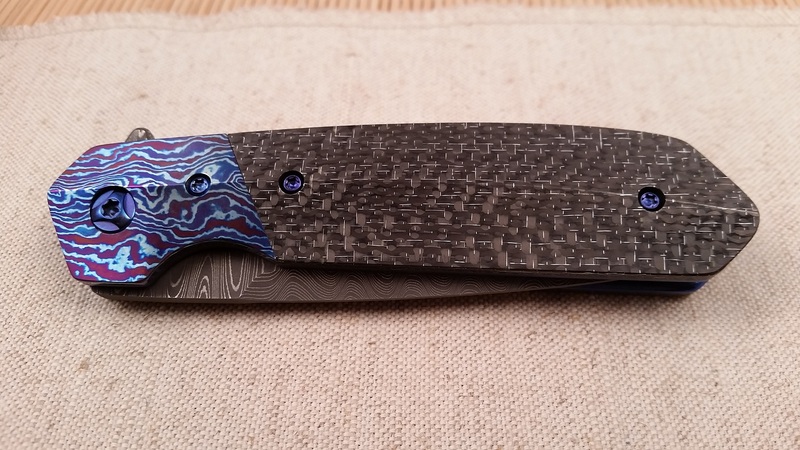 So let me tell ya.... it is a Mid-size 4F with heat-colored Timascus bolsters, Nicholls Ladder Damascus blade, Silver Lightning Strike Carbon Fiber handles, titanium fittings, Zirc stand-offs, and beveled and polished edges. Wanna see?..... [caption id="attachment_712" align="alignleft" width="300"] Open Bid knife[/caption] The Rangers knife has yet to be determined. Once the choice is made we will post pictures on the FB group page with details. But please be aware this is also only available to those Rangers in attendance, unless a Ranger wants to put in his extra ticket in your name.